A voice for Alberta workers. We are Teamsters Labour Union 987. We have been honoured to fight for the rights of our members and create fair workplaces across Alberta since 1942. With offices in Calgary and Edmonton, we are a family of more than 5,000 workers strong from over 13 industries and 40 collective agreements. When a member needs help, we step in to protect and empower them through powerful advocacy with employers, superior legal backing, and assistance with many other areas that contribute to a greater quality of life. 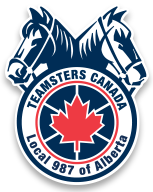 We are a proud local trade union within Teamsters Canada, which represents over 120,000 members from all over the country. On a broader level, we are part of the International Brotherhood of Teamsters, which includes 1.4 million members across North America. We are always expanding in membership whileenhancing our abilities to negotiate better agreements for our members. Every worker is entitled to dignity and respect in the workplace. This means good pay, fair hours, safe environments, security both now and in retirement, as well as the right to speak up and organize. When workers are happy, businesses have a greater chance of success, and we want that for our employers. When a company is successful, it makes a profit – we simply believe that it is only fair that profit must be shared reasonably with the people responsible for earning it. We take great pride in delivering positive outcomes for our members. We hear you when your employer may not. We are on your side.